Pursuing a gainful, enjoyable, and exciting career is the goal for pretty much everyone. Del-Air Heating & Air Conditioning Company is here to make that dream a reality for people who have what it takes to join our team. We are hosting an upcoming job fair at all eight of our locations. Be sure to stop by if you have been looking for a reliable career that keeps your attention. At our job fair, we are going to make it fun to learn about our premier Florida heating, air conditioner, and appliance service company. There are so many reasons why our team members love our company – and why we love our team members! 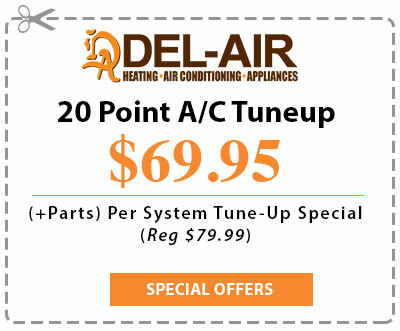 Some of the most popular benefits of Del-Air Heating & Air Conditioning, which is an ESOP (100% employee-owned company), are paid training, holidays, and vacation, provided medical/dental/vision insurance, Voluntary Supplemental Products, 401k programs, and MD Live – an emergency healthcare service we give every full-time team member. We are also proudly an Equal Opportunity Employer and a Drug Free Workplace. Visit Our Job Fair & Start Your Career! If you are thinking Del-Air Heating & Air Conditioning in Florida sounds like the right fit for you, then we would love to find out, too! Please visit one of our locations for our March 17th companywide job fair. We plan on hiring visitors who meet our high standards of excellence and customer satisfaction dedication. People who get signed-on during the job fair will be given a bonus that depends on their industry experience and qualifications. Be sure to bring a valid form of ID, your resume, and your best smile! Interested in knowing more about the upcoming Del-Air job fair? Contact one of our offices today to speak with a team member. You can also visit our careers webpage for additional information.